Yeah…I’m not much of a martini drinker. In fact, beyond a margarita and the very rare pina colada, I’m not much of a frou-frou drink drinker. But this concoction, when I saw it, made me stop and stare. My two favorite flavors are chocolate and cherry, and chocolate and cherry together. So when I saw this on the Country Outfitter newsletter, I knew I had to share, especially on the heels of Valentine’s Day. If you try this, let us know what you think! 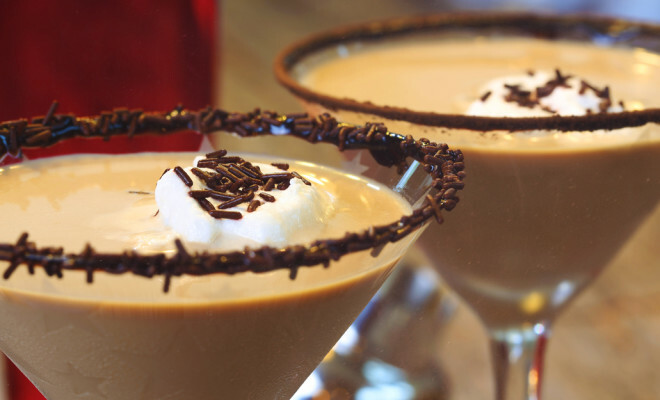 Directions: Coat rims of martini glasses in honey, then dip in chocolate sprinkles. In a cocktail shaker with ice, shake together milk, cherry juice, and vodka. Pour into glasses and top with any leftover sprinkles. I see no reason why you can’t make it virgin. Me? I’d pour it over chipped ice to make it slushy. Next time I hit the store, dark chocolate almond milk is definitely on the list! I’m not a fan of cherry flavors, but thinking the dark chocolate almond milk would make it better. The dark chocolate almond milk is amazing! I always have some at my house and at work.